A floater crystal of green chlorite phantoms, interrupted growth and growth craters is flamboyantly multi-terminated with small rainbows AND a rare iris for your healing and/or miniature collection. 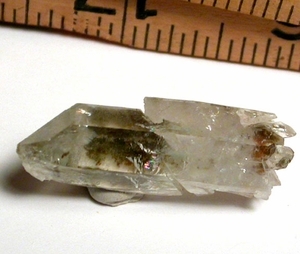 A fine study specimen at 1/2x 1-5/8" long, the central prism space is quite clear. You will notice also the after-calcite slice and pale white outer areas which give an impression of rotation between the halves of the crystal, but it is still in line. Wonderful!